I’ve had quite a few people ask me recently what diapers we use, so I thought it would make a great post topic – especially because the answer to that question is more complicated than one might think! Due to length, this is going to be a two part post, today and tomorrow. While I was still pregnant and we mentioned to people that we were planning to cloth diaper, most of them thought we were nuts or, at the least, that we didn’t realize what we were getting into and would change our minds once Nora came. Not once have I regretted cloth diapering. Not only is it incredibly easy, it’s also really fabulous to not have to have any sort of regular diaper or wipes bill. I don’t have to feel guilty about creating extra trash to take up valuable space in the landfill or about what nasty chemicals Nora is being exposed to 24/7 (in a very sensitive area, no less) through her diapers. 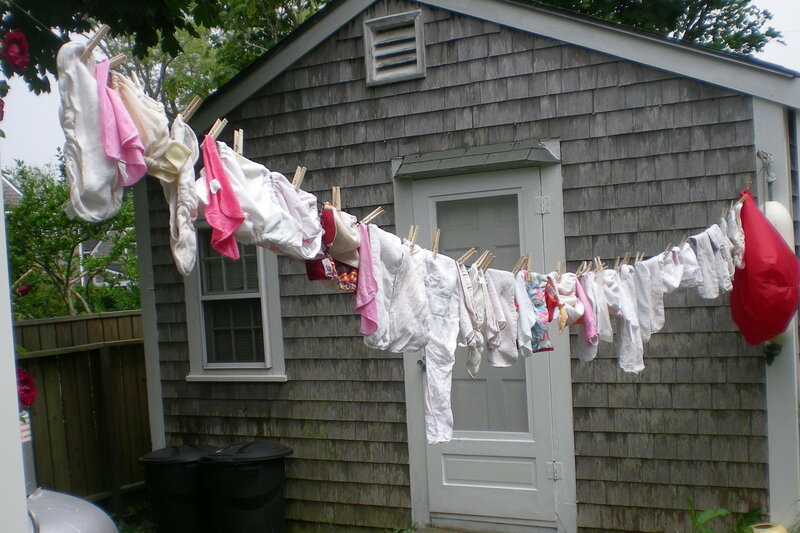 In some cases, cloth diapering has actually cut down on laundry: diaper blow outs, while a standard experience anytime we used disposables (while traveling for example), rarely if ever occurred with cloth. Additionally, cloth diapering has made me more aware of reusable options in other areas of the house: using cloths instead of sponges to wash dishes, cloth instead of paper towels to clean just about everything, Luna Pads and the Diva Cup instead of pads/tampons, etc. And I’m looking forward to the early potty training that usually accompanies cloth. So what diapers do we use? A lot of different ones! We have a really varied diaper collection for two reasons: first, because where I could, I bought used diapers, and second, because for a long time, I couldn’t decide which ones I liked best. Buying used diapers is a great way to go if you want to spend even less money. When we first started diapering we were using sized diapers (there are “sized” and “one-size” — “sized” means they fit a certain weight/age baby, “one-size” means one diaper will fit all size babies) that we bought from a family in New Paltz, NY. The mama sold me a complete stash of Snugglebottom contour diapers (30 sized small) and Bummis Super Whisper Wrap Diaper Covers (3 newborn sized and 6 small sized) for $40. 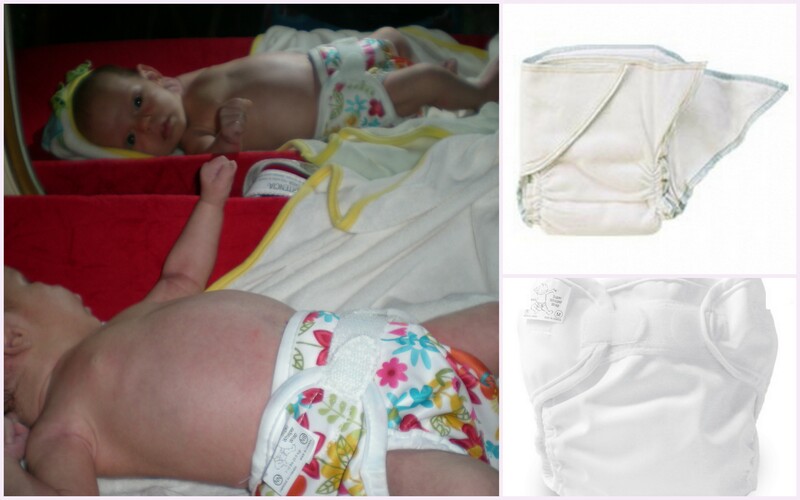 The Snugglebottom diapers are like a pre-fold (what most people think of when they think of cloth diapers), only they are cut to eliminate the folding. They are made of are made of soft, 100% cotton flannel and have a stretchy gather around the leg. Initially, we had to fold the top down because Nora was so small, but they were super absorbent (she could go through the night with no diaper changes from 9 pm or so until 7 am). The cover is what held the diaper in place (no pins necessary!) and made it waterproof. As long as she just had a wet diaper, we could use the same cover over and over, so you don’t need as many covers as you do diapers. I ended up buying a few more newborn sized covers from a local maternity and baby boutique, plus our diapering set up, which included: a changing pad and cover ($40), a 10 gallon lidded trashcan ($15), two large wet bags to put in the trash can (about $25 each), two small wet bags for the diaper bag ($22 each), and a large stack of cheap washcloths ($16). We were given the diaper stacker and we repurposed a plastic water bottle to wet the wipes (a.k.a. 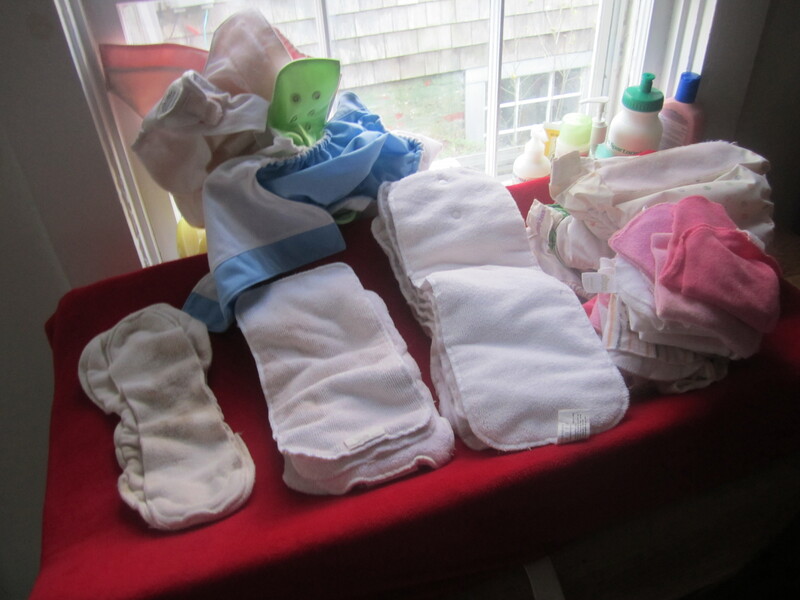 washcloths) as needed on the changing table. The initial set up and diapers cost us about $200 and Nora wore these diapers for her first 8 months. Human waste is a biohazard and should never, ever be left in a diaper to go to the landfill. That’s what I think is gross. And, truly, it’s not that bad (or that different from wiping it off baby’s bottom). I wash our diapers in hot water, with an initial soak and second rinse, using Charlie’s Soap (which we now use for all of our laundry). The diapers go in the dryer; the covers and wet bags are hung to dry. Sometimes on sunny summer days I would hang everything for some sunshine whitening action. You don’t want to use things like bleach or fabric softener on diapers because they’ll ruin the absorbency of the diaper and could irritate a baby’s skin. If you want to sanitize diapers (like I did with the used ones) you can boil them. Even when I was working full-time, I never felt inconvenienced or as if washing diapers was too much. It’s all about priorities, I guess. And her sweet little bottom was one of mine. 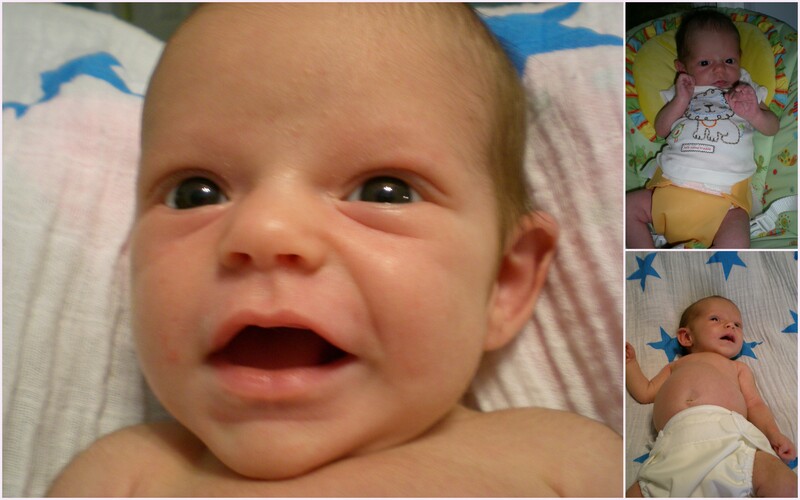 Tomorrow, I’ll talk about the many different types of diapers we’ve tried since she was 8 months old. 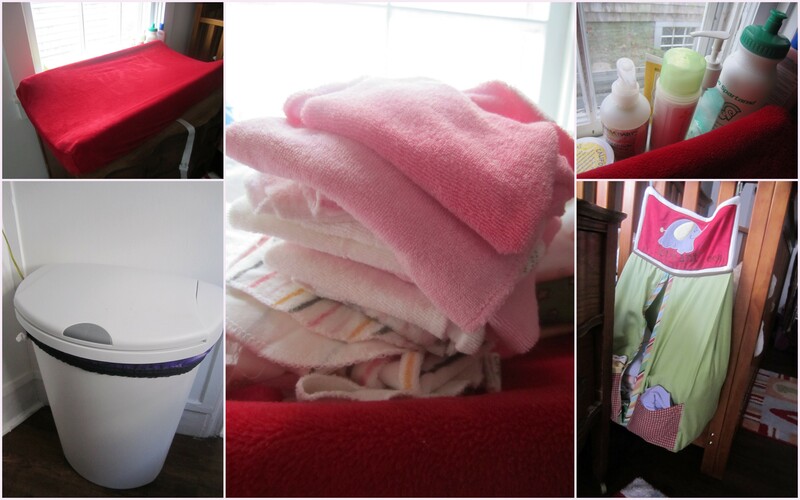 In the mean time, I’m happy to answer any questions about washing, creating an initial stash, finding used diapers, or cloth diapering a newborn. Amber, this is great, thank you! I admit, I am one of those people who think that disposables will be easier since I will be going back to work, but maybe I will have to re-think that. Thanks for the information! The only part that could be challenging with cloth is finding childcare that will do it too. I’m not sure if all institutional day cares would do it or not. We had a stay at home mom watch Nora and she was willing to learn them even though she hadn’t done it before. I’ve heard that most day cares require that you bring disposables. The big draw for me is the cost savings, but we will probably use disposables in certain situations. The cost savings is incredible. When I was writing this I was trying to figure out how much I saved and it’s well into the thousands already. Even buying diapers in bulk from diapers.com, it looks like they would be $0.25 a piece! Are you for sure going to go with a day care? If you haven’t considered it yet, you might want to look into finding a mom who who just has her kids and one or two more…not even a licensed family daycare. We did that and couldn’t have been any happier. I felt like Nora got one-on-one attention as the only baby, and there was a lot more flexibility for how we wanted things (I.e. not vaccinating, cloth diapers, breastfeeding at lunch, etc.). That said if you go with all-in-one or pocket diapers (which I’ll talk about tomorrow) you might be able to convince a daycare once they see how easy they are. You could also use cloth at home and disposable at day care, which would provide some costs savings over only disposable. The best way to look for used diapers is to see if there is a mom’s group or online message board where you can post a wanted ad. That’s how I found mine. You could probably find a group of moms who cloth diaper by asking at a prenatal yoga class or natural maternity store, or by asking a doula who should be able to direct you to like-minded mamas. Hey Amber, I used cloth diapers at a day care with my two oldest ones which started at the day care around age 2. There are three tricks to cloth diapers at a day care. 1. The need to be all assembled so changing into the cloth diaper is as easy for them as disposable. So pocket diapers work best for this. Also, consider getting the paper, flushable liners and have them line the diapers before each use. Then they can toss the liners in the toilet when they change them. 2. Provide a large ziplock bag. This is where they throw the used diapers for you to take home. Ziplock tends to keep the smell minimal. Ideally you put a cotton ball soaked in lavendar or citrus oil in it to keep the smell down too. But as long as they flushed the solids using the paper liners, the smell is minimal. 3. Provide a few disposables. Whether it is true or not, the staff will initially feel you are making more work for them. When you ask people to do things differently just for you, they feel like they are doing more work, even if they aren’t. So, bring in a few disposables and tell them ” I don’t mind if you use a disposable from time to time when things are too chaotic for you to deal with the cloth”. My day care teachers probably used 10 disposables TOTAL in all the months and months my two girls were there. I gave them much praise and thanks each time they gave me a bag of dirty cloth diapers, and I asked over and again if they were doing OK with it. I never gave them grief when they told me they put on a disposable, but would ask if there was something I could do to make the cloth diapering easier. No one, in the history of this long standing day care had ever asked for this, and to this day they talk about it and how “it wasn’t so bad”. It just took some effort on my part to get them on board. Good luck! Thanks for the input, Mary! It’s great to hear from someone who made daycare and cloth work! Amber, I am a friend of you grandmother Norma, and even ithough I don’t have babies in the family I really enjoyed reading your website and think what you are great for sharing info with other moms. My best your way.